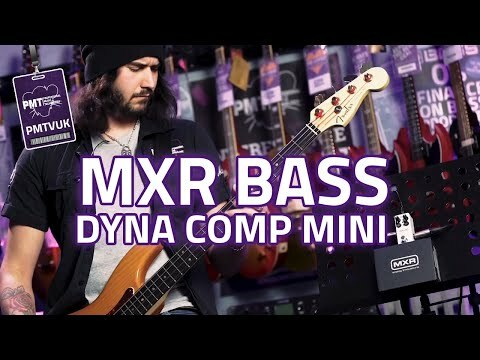 The brand new MXR Dyna Comp Bass Compressor provides bass players with the most iconic compression sound in music history but in a pedalboar.. The brand new MXR Dyna Comp Bass Compressor provides bass players with the most iconic compression sound in music history but in a pedalboard friendly chassis with superb controls specifically tweaked for bass players. This new bass compression pedal has been built around the classic CA3080 “metal can” integrated circuit, renowned for its quiet operation, superior transparency, and increased dynamic range. The MXR Dyna Comp Bass Compressor provides exceptional control over your sound. You have Clean, Sensitivity, Output and Tone controls as well as an Attack switch that dictates how much bite you want the compression to have. This is a lot of control over your sound considering it’s such a small pedal and something that professional players, sessions musicians and discerning bass players will really appreciate. It’s powered via 9V power supply as it’s too small for a battery, but you’ll definitely appreciate the smaller size if you are short on room on your pedalboard.